52. Cantos LII-LXXI. London: Faber & Faber, 1940. Two of the most sustained honorific passages in The Cantos occur here, in the so-called ‘Chinese History Cantos’ (LIII-LXI) and the ‘John Adams Cantos’ (LXII-LXXI), the former of which relies extensively on de Mailla’s eighteenth century Histoire Générale de la Chine (D1b), which includes long passages about Japan, some of which Pound incorporates. Nolde’s analysis (166) of Pound’s use of this source is particularly thorough. Critics have demonstrated as well a source in a French translation of Nippon odai ichiran (Annals of the Emperors of Japan, D1c), though several who have called attention to this work have been mistaken, as was Pound himself (see 82b4), in assertions that the translator was Klaptroth, who was editor of the translation by Isaak Titsingh. A third source for the Japanese history material would have been a French translation of J. G. Scheuchzer’s English translation of Kaempfer (see D1a), though no critic has yet analysed the degree to which Pound relies on that work. a. LVI. Kimpel and Eaves (162) demonstrate that the source of lines 65-73 (57, pp. 302-03) is the Klaptroth edition of Titsingh’s translation of Nippon odai ichiran ; the canto also addresses Kublai Khan’s failed attempts to subdue Japan in 1274 and 1281, Pound’s knowledge of which would have come from de Mailla. b. LVII. Closes with reference to the sixteenth-century Japanese pirate attacks against the Ming empire, lines derived from de Mailla. See Nolde, pp. 321-22, for details of Pound’s adaptation of the source. c. LVIII. In the service of his larger aim of relating the history of China, Pound begins here with a condensed history of Japan, from the legendary seventh-century B.C. reign of the first Emperor Jimmu to Toyotomi Hideyoshi’s edicts against Christianity and late sixteenth-century raids on Korea, with attention focused particularly on belief in the divine origins of the Japanese throne. 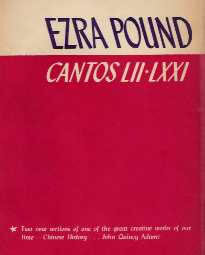 The passage includes an assertion not found in Pound’s sources but in keeping with his enterprise in these middle cantos: that the court in Kyoto, upholder of the ‘sciences, poetry, history [and] dancing’, fell into decline because it ‘ran into debt to keep up appearances’ (p. 316). This Poundian commentary aside, the sources are Klaptroth and de Mailla. Several commentators have provided notes about the non-standard nomenclature of the passage: ‘Sinbu’ is a reference to Jimmu, the first legendary Emperor of Japan; ‘Sun land’ is Japan, from the first kanji in ‘Nippon’; ‘DAI’ is from Japanese pronunciation of the Sino-Japanese character meaning ‘great’; Joritomo refers to Minamoto Yoritomo (see BJ4i); Miaco is present-day Kyoto, from Miako, ‘capital’; Ten Seo DAISIN is a corruption of a Chinese reading for the Sino-Japanese character referring to Amaterasu Ômikami, the Japanese sun-goddess from whom the imperial family is said to descend; ‘Messire Undertree’ refers to Hideyoshi, from a loose English translation of the Sino-Japanese character for ‘Toyotomi’; ‘Sa Mo’ is Satsuma, the region of Hideyoshi’s birth, from a Chinese transliteration of the character.